The Northwest Bach Festival’s Artistic Director is Zuill Bailey who was named Artistic Director Designate in 2013 succeeding Gunther Schuller. 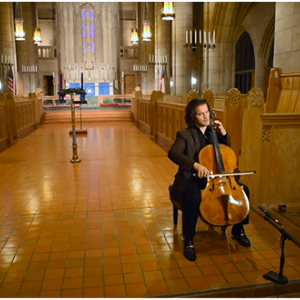 Zuill Bailey is a world-renowned cellist, in-demand guest artist and top selling recording artist. He also serves as Artistic Director of El Paso Pro Musica in Texas and Sitka Summer Music Festival & Alaska Classics Series and Guest Artistic Director of the Classical Inside Out Series of the Mesa Performing Arts Center in Arizona. His influence has expanded the cultural effect of the Northwest Bach Festival’s music throughout the region and calendar year. The Festival & Series concerts are presented in a variety of unique venues that help dissolve barriers between performers and listeners including Barrister Winery & Event Center with Bach @ Barrister concerts as well as regular concerts in Spokane’s magnificent landmark, St. John’s Cathedral. Expanded community engagement activities offer the gift of classical music to a broader community with free Bach’s Lunch programs, Flash-Bach! appearances, visits to hospitals, recovery shelters, hospices and more along with Zuill In School programs for students of all ages. Connoisseur Concerts was organized in 1970 in Spokane, Washington and incorporated as a 501c3 non-profit organization in 1973. 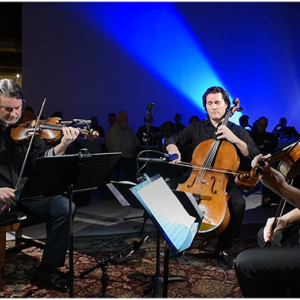 The original purpose was to offer a series of chamber music concerts performed on baroque period instruments. The annual Northwest Bach Festival was implemented into the series in 1978. Since the inception of the organization, founded by Beverly Biggs and David Dutton, several world-renowned musicians have held the Artistic Director positions, and consequently the artistic direction has evolved. In 1990 the Board of Trustees evaluated the direction of the organization and chose to concentrate on the annual Northwest Bach Festival and a summer Mozart series in outdoor venues. In 2013 the Northwest Bach Festival contracted with Zuill Bailey to serve as Artistic Director, and he and the Executive Director Gertrude Harvey with enthusiastic support from the community have, in three years, expanded a basic four-concert Festival into a Festival & Series with over 30 programs throughout the year and with a regional presence. The Festival & Series now offers concerts in Walla Walla and Coeur d’Alene, Idaho. In addition, extensive community engagement activities reach a diverse population with free events and programs for those unable to participate in public performances due to illness, limited resources or challenging personal circumstances. It was a grassroots effort on the part of a small group of music lovers who, 25 years ago, created what has become one of Spokane’s fabulous summer celebrations - Mozart on a Summer’s Eve. Charlotte Lamp was on the Connoisseur Concerts Board when she, Susan Kennedy and Francie Kozinski, wife of Connoisseur Concerts Artistic Director Stefan Kozinski, were talking about there being no summer event since a change in state law eliminated the Connoisseur Concert’s annual wine auction. “Someone said, Mozart in Manito and that sounded like such a good idea. Francie talked to Stefan about our idea,” said Charlotte as she shared her remembrances. Stefan, who died last year, must have carried the idea to Verne Windham, a well-known horn player with a reputation for loving to play music with his friends. “I looked for any excuse to play music with my friends,” remembered Verne who organized the first wind band and has continued for the last 25 years. He said a wind octet was natural since it doubled the four wind instruments. 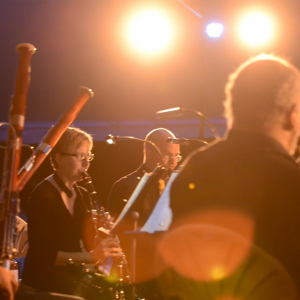 The original octet included Verne and horn player Roger Logan who has played all 25 years, bassoonists Barbara Novak and Glenn West, clarinetists Anthony Taylor and John Fritz and oboists Barbara Cantlon and Susan Laney. While Verne was selecting the music and organizing the musicians, Charlotte and Francie decided this should be a party, with refreshments of course. Charlotte made 150 cream puffs for all the ticket buyers. They arranged to borrow tables and chairs. Charlotte “hoodwinked” her son and some 8th grade students from All Saints School where she taught to serve as waiters. “They dressed up in white shirts and did a great job making this a very special event,” she said. 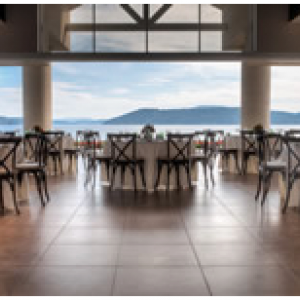 That first year the event was held for the Connoisseur Concerts board members, their family and friends. They must have had a large number of friends since about 150 people attended the event with music by Mozart and cream puffs baked in the Lamp kitchen. The first concert was July 17, 1990. According to an article by Travis Rivers in the Spokesman-Review Spokane Chronicle in 1992, the response was so great, the board decided to invite the public. The Duncan Garden fountain was the location for the stage during the first few years. The patterns of flower beds were still on the sketchpad of a park gardener so the grass around the fountain made a great location for the midsummer musical experience. Verne created a stage that wrapped around the fountain, which of course was turned off for the concert preparations. The back legs were placed in the fountain and the front legs on the grass. The first year, the music was all instrumental and Stefan wrote a narration for the Mozart opera, “Cosi fan tutte” whose Overture is also on the 2015 program. After that first year, singers were added, much to the delight of the audience. Both Verne and Charlotte remember Frank Hernandez singing and wandering through the audience popping grapes into his mouth as he sang. When the Duncan Gardens flowerbeds were expanded, the concert moved to its present site, the lawn East of the fountain in an area we call the Mozart Meadow. A beautiful and sturdy garden-arbor sound shell and stage were built with the help of a generous underwriter. Strings have been added to the music program. Audience appeal has steadily grown. A second performance has been added. The next stage of growth is being thoughtfully considered. As the 25th Anniversary Year is celebrated, it is fun to look back. Volunteers still are an important part of the production, even as Mozart on a Summer’s Eve has evolved into a professionally-produced event. 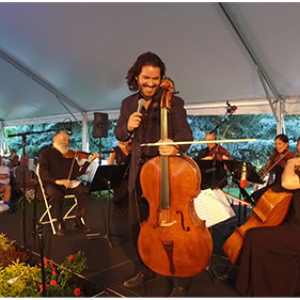 At the heart of Mozart on a Summer’s Eve, as the event looks ahead to the next chapters, the original idea of celebrating the beauty of music, nature, friendships and community in Spokane’s beautiful Manito Park remains primary. The Board of Trustees of Connoisseur Concerts is comprised of individuals in business, education, music and arts who are interested in preserving the legacy of two of the world's most renowned composers, Bach and Mozart, in live performances. The organization is managed by a professional Executive Director. Connoisseur Concerts contracts with professional musicians for all of its programs and combines the talents of local artists with guest artists for its concerts. Financial support is provided by generous individuals, businesses and foundations who value the enhanced quality of life that fine music brings to the human spirit.. The mission of Connoisseur Concerts is to present musical performances of world-class quality utilizing local and visiting artists. Every effort is made to educate and to heighten community appreciation of classical music and music history.